The Hunters Moon Inn01873 821499work01873 821499fax InnWelcoming 13th century inn nestling in the glorious Monmouthshire countryside on Offa's Dyke footpath. Taste of Wales restaurant serving traditional country food using the best fresh local ingredients. Four charming bedrooms, all en-suite, and hearty cooked breakfasts to set you up for the day. £65 per room per night. Single occupancy £50 per night. Special facilities for walkers and cyclists. Log fires in winter and sunny terrace and delightful poolside garden in summer. 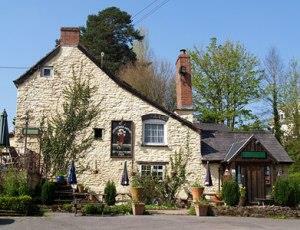 Welcoming 13th century inn nestling in the glorious Monmouthshire countryside on Offa's Dyke footpath. Peaceful location, positively no music, games machines or mobile phones. From London, Bristol and the East: M4 Junction 25a. A4042 to Cwmbran and Abergavenny. By-pass Abergavenny on A465 Hereford road. At start of dual carriageway turn right on the B4521, direction Skenfrith. After about five miles turn turn left at the far end of the village of Llanvetherine along country lane signposted Llangattock Lingoed. Keep on for about 1.5 miles until arriving at Hunter's Moon Inn.